Nanoparticle research is currently an area of immense scientific interest due to a wide variety of applications in biomedical, optical, and electronic fields. This is mainly due to their properties (depending on the material they consist of) such as: (i) High electron density and strong optical absorption (e.g., metal particles, in particular Au), (ii) photoluminescence (semiconductor quantum dots, e.g., CdSe or CdTe) or phosphorescence (doped oxide materials, e.g. Y2O3), (iii) magnetic moment (e.g., iron-oxide, γFe2O3, La0.7 Sr0.3 MnO3, or cobalt nanoparticles),, and (iv) a high surface area-to-volume ratio as compared to their bulk counterparts. Moreover, it is their large surface area that makes them more amenable to functionalize with various targeting agents to deliver nanoparticles to the diseased site. Owing to their small size (1–100 nm), nanoparticles can penetrate the cell interior and even cross the blood-brain barrier when labeled with appropriate agents such as polysorbates and chitosan., Among nanoparticles, iron oxide nanoparticles (IONPs) have gained immense attention for various biomedical applications due to their biocompatibility and relatively economic and simple method of synthesis. IONPs are superparamagnetic in nature (i.e., they have high magnetic moment in the presence of an external magnetic field and zero coercivity at room temperature) as against the ferromagnetic property of their bulk counterparts at room temperature. This property makes IONPs as an excellent candidate for magnetic hyperthermia therapy (MHT) as heat generation can be controlled/modulated by an externally applied alternating current magnetic field (AMF). Moreover, IONPs formulations having high specific absorption rate value may be developed, thereby enabling the use of low concentrations of IONPs for MHT applications, and thus, minimizing the inherent toxicity of the formulations. HT involves exposing the diseased site (here it is tumor tissue) or whole body to an elevated temperature (42–43°C), which either kills the tumor cells directly or sensitizes them to chemo-/radiation-therapy. However, conventional HT suffers from two major drawbacks: (i) Nonaccessibility of the deep-seated tumors and (ii) nonuniform heating of the tumor tissue due to the generation of a temperature gradient from the surface to the tumor core. These limitations cause insufficient killing of tumor cells and severe side effects such as skin burns, blisters, pain, and discomfort to the patients. These drawbacks can be significantly overcome by the application of MHT due to following reasons. IONPs can be specifically targeted to the tumor site and thus can heat the tumor from within and more uniformly. This feature minimizes the development of temperature gradients and thermoresistance in tumor, and thus enabling better tumor control. Although MHT alone is significantly effective, a combinatorial approach of MHT along with chemo-, radiotherapy, and other sensitization approaches may lead to a much better cancer treatment. The tumor microenvironment characterized by leaky/disorganized vasculature, nutrient deprivation, hypoxic tumor cores, and acidosis leads to the development of radioresistance [Figure 1],,,, which can be largely overcome by the application of HT through the mechanism of vasodilation and subsequent increased blood (oxygen) supply to the hypoxic regions of the tumor. It may be noteworthy to mention that even though the combinatorial approach of chemotherapy (CT) with radiotherapy (RT) has been well practiced clinically, combining RT with HT has shown limited success in clinic. In the present review, an overview of the current status of MHT in clinics has been presented along with its emerging therapeutic potential in combination with RT [Figure 1]. In clinics, HT has been used along with RT for the treatment of various tumor types such as head and neck, breast, prostate, and other superficial lesions., The radiosensitization ability of HT is known to be mainly due to heat induced-increased oxygenation of the tumor mass. In one study, HT was used to improve the tumor oxygenation along with RT for the treatment of soft tissue sarcomas. Results showed a positive correlation between the magnitude of improved tumor oxygenation after first HT fraction and percentage necrosis in the resection tumor specimen. Song et al. demonstrated a significant rise in tumor oxygenation in R3230 Ac adenocarcinoma tumors of Fischer rats after mild hyperthermia. Measurement of the oxygenation status using a polarographic oxygen electrode system showed that the tumor pO2 measured within 10–15 min after heating (for 30 min at 42.5°C) was about three-folds greater than that in the control tumors. In another study, HT was combined with radiation for the treatment of locally advanced prostate cancer. In these patients, at a median follow-up of 70 months (range: 18–110 months), the 7-year overall survival rate was 94% and out of that, 61% of patients showed no recurrence. Thus, HT seems to be a promising approach; however, its application in clinics is not well appreciated, probably due to the conventional mode (such as water bath and infra-red) of application of hyperthermia. This limitation is overcome by MHT, and hence, it may prove to be an effective alternative mode for HT of cancer. Compared to conventional HT, MHT has received immense attention due to several reasons such as (i) targeted, homogenous, and controlled heat generation capacity; (ii) the ability to access deep-seated tumor; and (iii) ability to specifically target the tumor vasculature/hypoxic tumor cells. In this direction, significant progress has been made to formulate IONPs for efficient targeting to tumor vasculature  and hypoxic regions, however, their application for MHT needs to be established. In addition, MHT may also be employed to co-deliver drugs (such as anti-cancer agents, angiogenesis inhibitors, and radiosensitizers) for efficient combination therapy. Current targeting approaches for nanoparticles include ligands such as antibodies, peptides, and porphyrins to improve tumor uptake and specificity of the desired drug, and thus lower the amount of drugs needed for cancer treatment., Many other novel strategies have been developed to target nanoparticles to the tumor site. In one such approach, Ohta et al. recently developed nanoparticles functionalized with folic acid (FA). The presentation of FA on the surface of the nano-assembly was controlled by changing its shape using DNA as molecular keys. This in turn changes the position of FA from hidden to exposed state, thereby making it available for interaction with tumor cells over-expressing FA receptors resulting in enhanced (2.5 folds) targeted delivery of the nanoformulation to the tumor site. Most of these targeting approaches are used for the delivery of anti-cancer agents along with nanoparticles. However, utilization of these targeting strategies for IONPs would enable increased accumulation of the IONPs as well as the drug at the tumor site, thus resulting in effective heating during magnetic hyperthermia-based cancer therapy. Several studies for preclinical applications of MHT are reported in literature. Zhao et al. (2012) reported the application of magnetic nanoparticles (MNPs) for the treatment of head and neck cancers using a mouse xenograft model. Results showed that the temperature of the tumor center was dramatically elevated from body temperature to 40°C in 5–10 min. This hyperthermia treatment resulted in necrosis in the treated tumor tissue. Similarly, Hu et al. used MHT for the treatment of murine lung carcinoma models. Results showed inhibition of the tumor growth via induction of apoptosis. Shetake et al. recently demonstrated the efficacy of oleic acid coated IONPs for MHT of murine fibrosarcoma tumor models. Results showed significant inhibition of tumors after MHT by induction of apoptosis via modulation of heat shock protein 90 (HSP 90)/AKT pathway. It may be pertinent to emphasize that in these animal studies, MNPs were injected intratumorally, a mode of injection not suitable for deep-seated and metastatic tumors. Moreover, intratumoral injections may cause tumor incongruence, invasiveness, and recurrence, especially from under-treated tumor regions. Therefore, for targeting and systemic administration of MNPs, intravenous injection is the preferred route. However, so far, it has been difficult to achieve the effective concentrations in tumors when MNPs were administered through intravenous route. Huang and Hainfeld demonstrated intravenous administration of polyethylene glycol-coated IONPs, with a well-tolerated dose, achieving a tumor concentration of 1.9 mg Fe/g of tumor tissue in a subcutaneous squamous cell carcinoma mouse model, with a tumor-to-nontumor ratio of >16. With an applied field of 38 kA/m at 980 kHz, tumors could be heated to 60°C for 2 min ablating them with millimeter range. Route of administration of MNPs may vary depending on the type of cancer. For example, in case of lung cancer, inhalation would be the preferred route of administration. Sadhukha et al. demonstrated the administration of inhalable epidermal growth factor receptor-targeted MNPs in a murine orthotopic model of nonsmall cell lung carcinoma, which showed significant enhancement in targeting and retention of MNPs in the lung tumors. Moreover, in combination with AMF, it showed a significant growth inhibition of these tumors. This study also demonstrated that pulmonary delivery of targeted IONPs can circumvent their nonspecific distribution into organs such as liver and spleen, which commonly receive the highest concentration when NPs were administered intravenously. Thus, (i) targeting by tumor cell-specific molecules (e.g., antibodies, receptors or ligands, etc.,), (ii) an appropriate choice of route of administration of MNPs, based on cancer type, and (iii) combination with other modalities such as CT  or RT may result in accomplishment of a better tumor control. Cancer relapse and its metastatic spread is a major challenge for the clinicians. Cancer stem cells (CSCs) were found to contribute to these features of cancer in addition to the mechanism of chemo- and radio-resistance. Many molecular and cellular approaches have been developed to target and kill the CSCs. Strategies for the application of MHT to target and kill the cancer cells are quite nascent but could prove highly effective, if the challenging task of targeting the CSCs in the tumor mass with MNPs could be achieved. Recently, Burke et al. compared the effectiveness of breast CSCs killing by conventional and nanoparticle-mediated photothermal therapy. Their findings suggest that breast CSCs are resistant to conventional hyperthermia partly due to the higher basal expression of HSP 90. In contrast, when these breast CSCs were treated with multiwalled carbon nanotubes, they became sensitive to hyperthermia delivered using a low power 1064 nm near infrared laser. It has been inferred that the cell death after laser-based HT was proportional to the time of laser exposure. Further,in vivo evaluation of efficacy of nanoparticle-mediated hyperthermia showed 100% survival of the mice compared to 20% survival in control. Atkinson et al. showed that in combination therapy, i.e., radiation therapy followed by optically activated gold nanoshells-based MHT resulted in radiosensitization of breast CSCs. Forty-eight hours after treatment, cells derived from the tumors treated with ionizing radiation and hyperthermia showed a significant decrease in tumorigenicity as well as increased differentiated phenotype than individual treatments. In another study, Galanzha et al. selectively targeted the circulating breast CSCs by tagging MNPs to folate or anti-human CD44 antibodies. Cancer cells targeted with these conjugated antibodies showed higher photothermal-based ablation when treated with NIR light., Sadhukha et al. demonstrated the efficacy of IONPs-mediated MHT in human lung and breast CSCs. Results showed that MHT caused a significant decrease in the CSCs of lung (A549) and breast (MDA-MB-231) carcinoma cells. Moreover, MHT was found to be significantly effective to suppress the colony and mammosphere formation of these tumor cells inin vitro conditions, respectively. Thus, these studies suggest that nanoparticles-based MHT may be an effective modality to kill CSCs and suppression of tumor growth and recurrences, which however, need to be further validated in other tumor models and under the clinical scenario. The first step toward the application of MHT in clinics was the development of magnetic field therapy system for treatment of human patients. Gneveckow et al. developed the first clinical 100-kHz, ferrite core-based magnetic field applicator, magnetic fluid hyperthermia (MFH ®) 300F (MagForce Nanotechnologies AG, Berlin, Germany) with a magnetic field strength of up to 18 kA/m in a cylindrical treatment area (20 cm diameter and aperture height 300 mm). Johannsen et al. showed for the first time, the clinical application of MHT for prostate cancer in a 67-year-old patient, using aminosilane-coated MNPs and the MagForce MFH 300F applicator (100 kHz radio-frequency and variable field strength (0–18 kAm −1). Hyperthermia using MNPs was feasible and well tolerated in this pilot study, in previously irradiated and locally recurrent prostate carcinoma. In another study, Matsubara et al. reported a novel MHT system for the treatment of patients with bone metastases. They used a calcium phosphate cement containing MNPs for MHT and combined the therapy with acridine orange for photodynamic therapy. MHT was applied postoperatively by inserting the limb into a cylindrical coil of the electromagnetic field generator. This MHT treatment was performed in six patients with seven bone cancer metastasis locations. Their study showed that this combination therapy for bone metastasis can preserve the limb function without local recurrence. Thus, this clinical evidence signifies the potential of MHT as a promising and emerging modality for combinatorial cancer therapy. In addition, optimization of the treatment plans (combining MHT and RT or CT) needs to be carried out in order to acquire maximum therapeutic gain, with minimum side effects to the patients. Horikoshi S, Serpone N, editors. Introduction to nanoparticles. In: Microwaves in Nanoparticle Synthesis: Fundamentals and Applications. Weinheim, Germany: Wiley-VCH Verlag GmbH and Co. KGaA; 2013. Sperling RA, Parak WJ. Surface modification, functionalization and bioconjugation of colloidal inorganic nanoparticles. Philos Trans A Math Phys Eng Sci 2010;368:1333-83. Masserini M. Nanoparticles for brain drug delivery. ISRN Biochem 2013;2013:238428. Jain KK. Nanobiotechnology-based strategies for crossing the blood-brain barrier. Nanomedicine (Lond) 2012;7:1225-33. Trana N, Webster TJ. Magnetic nanoparticles: Biomedical applications and challenges. J Mater Chem 2010;20:8760-7. Habash RW, Bansal R, Krewski D, Alhafid HT. Thermal therapy, part 2: Hyperthermia techniques. Crit Rev Biomed Eng 2006;34:491-542. Vernon CC, Hand JW, Field SB, Machin D, Whaley JB, van der Zee J, et al. Radiotherapy with or without hyperthermia in the treatment of superficial localized breast cancer: Results from five randomized controlled trials. International Collaborative Hyperthermia Group. Int J Radiat Oncol Biol Phys 1996;35:731-44. Barker HE, Paget JT, Khan AA, Harrington KJ. The tumour microenvironment after radiotherapy: Mechanisms of resistance and recurrence. Nat Rev Cancer 2015;15:409-25. Zagar TM, Oleson JR, Vujaskovic Z, Dewhirst MW, Craciunescu OI, Blackwell KL, et al. Hyperthermia combined with radiation therapy for superficial breast cancer and chest wall recurrence: A review of the randomised data. Int J Hyperthermia 2010;26:612-7. Yoshimura M, Itasaka S, Harada H, Hiraoka M. Microenvironment and radiation therapy. Biomed Res Int 2013;2013:685308. Kaur P, Hurwitz MD, Krishnan S, Asea A. Combined hyperthermia and radiotherapy for the treatment of cancer. Cancers (Basel) 2011;3:3799-823. Rao W, Deng ZS, Liu J. A review of hyperthermia combined with radiotherapy/chemotherapy on malignant tumors. Crit Rev Biomed Eng 2010;38:101-16. Brizel DM, Scully SP, Harrelson JM, Layfield LJ, Dodge RK, Charles HC, et al. Radiation therapy and hyperthermia improve the oxygenation of human soft tissue sarcomas. Cancer Res 1996;56:5347-50. Song CW, Shakil A, Osborn JL, Iwata K. Tumour oxygenation is increased by hyperthermia at mild temperatures 1996. Int J Hyperthermia 2009;25:91-5. Hurwitz MD, Hansen JL, Prokopios-Davos S, Manola J, Wang Q, Bornstein BA, et al. Hyperthermia combined with radiation for the treatment of locally advanced prostate cancer: Long-term results from Dana-Farber Cancer Institute study 94-153. Cancer 2011;117:510-6. Kelland LR. Targeting established tumor vasculature: A novel approach to cancer treatment. Curr Cancer Ther Rev 2005;1:1-9. Brown JM, Wilson WR. Exploiting tumour hypoxia in cancer treatment. Nat Rev Cancer 2004;4:437-47. Kumar CS, Mohammad F. Magnetic nanomaterials for hyperthermia-based therapy and controlled drug delivery. Adv Drug Deliv Rev 2011;63:789-808. Yu MK, Park J, Jon S. Targeting strategies for multifunctional nanoparticles in cancer imaging and therapy. Theranostics 2012;2:3-44. Reddy GR, Bhojani MS, McConville P, Moody J, Moffat BA, Hall DE, et al. Vascular targeted nanoparticles for imaging and treatment of brain tumors. Clin Cancer Res 2006;12:6677-86. Ohta S, Glancy D, Chan WC. DNA-controlled dynamic colloidal nanoparticle systems for mediating cellular interaction. Science 2016;351:841-5. Zhao Q, Wang L, Cheng R, Mao L, Arnold RD, Howerth EW, et al. Magnetic nanoparticle-based hyperthermia for head and neck cancer in mouse models. Theranostics 2012;2:113-21. Hu R, Ma S, Li H, Ke X, Wang G, Wei D, et al. Effect of magnetic fluid hyperthermia on lung cancer nodules in a murine model. Oncol Lett 2011;2:1161-4. Shetake NG, Kumar A, Gaikwad S, Ray P, Desai S, Ningthoujam RS, et al. 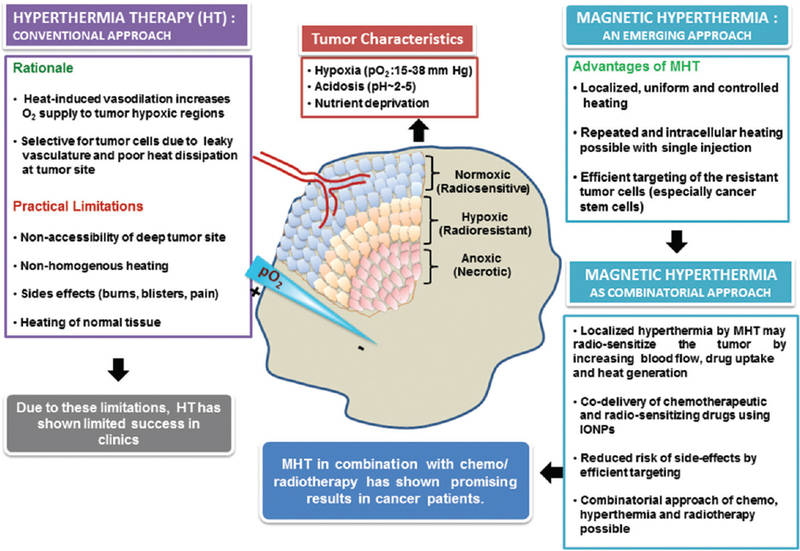 Magnetic nanoparticle-mediated hyperthermia therapy induces tumour growth inhibition by apoptosis and Hsp90/AKT modulation. Int J Hyperthermia 2015;3:909-19. Huang HS, Hainfeld JF. Intravenous magnetic nanoparticle cancer hyperthermia. Int J Nanomedicine 2013;8:2521-32. Sadhukha T, Wiedmann TS, Panyam J. Inhalable magnetic nanoparticles for targeted hyperthermia in lung cancer therapy. Biomaterials 2013;34:5163-71. Kossatz S, Grandke J, Couleaud P, Latorre A, Aires A, Crosbie-Staunton K, et al. Efficient treatment of breast cancer xenografts with multifunctionalized iron oxide nanoparticles combining magnetic hyperthermia and anti-cancer drug delivery. Breast Cancer Res 2015;17:66. Burke AR, Singh RN, Carroll DL, Wood JC, D'Agostino RB Jr., Ajayan PM, et al. The resistance of breast cancer stem cells to conventional hyperthermia and their sensitivity to nanoparticle-mediated photothermal therapy. Biomaterials 2012;33:2961-70. Atkinson RL, Zhang M, Diagaradjane P, Peddibhotla S, Contreras A, Hilsenbeck SG, et al. Thermal enhancement with optically activated gold nanoshells sensitizes breast cancer stem cells to radiation therapy. Sci Transl Med 2010;2:55-79. Galanzha EI, Kim JW, Zharov VP. Nanotechnology-based molecular photoacoustic and photothermal flow cytometry platform forin vivo detection and killing of circulating cancer stem cells. J Biophotonics 2009;2:725-35. Galanzha EI, Shashkov EV, Kelly T, Kim JW, Yang L, Zharov VP.In vivo magnetic enrichment and multiplex photoacoustic detection of circulating tumour cells. Nat Nanotechnol 2009;4:855-60. Sadhukha T, Niu L, Wiedmann TS, Panyam J. Effective elimination of cancer stem cells by magnetic hyperthermia. Mol Pharm 2013;10:1432-41. Gneveckow U, Jordan A, Scholz R, Brüss V, Waldöfner N, Ricke J, et al. Description and characterization of the novel hyperthermia- and thermoablation-system MFH 300F for clinical magnetic fluid hyperthermia. Med Phys 2004;31:1444-51. Johannsen M, Gneveckow U, Eckelt L, Feussner A, Waldöfner N, Scholz R, et al. Clinical hyperthermia of prostate cancer using magnetic nanoparticles: Presentation of a new interstitial technique. Int J Hyperthermia 2005;21:637-47. Matsubara T, Kusuzaki K, Matsumine A, Asanuma K, Nakamura T, Uchida A, et al. A minimally invasive surgery for bone metastases using the combination of photodynamic therapy and hyperthermia treatment. Int J Clin Med 2013;4:357-63.